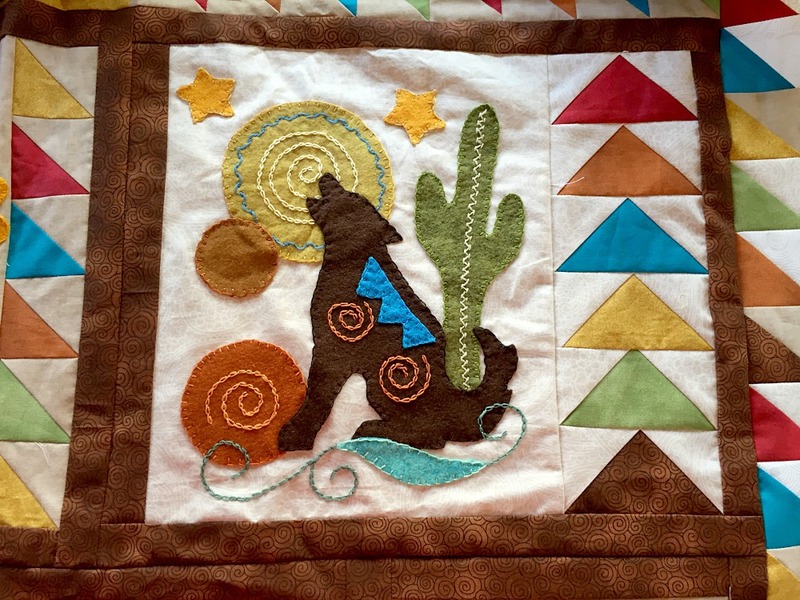 Sonoran Trail Sew Along- Hummingbird and Coyote! Join this unique Sew Along! 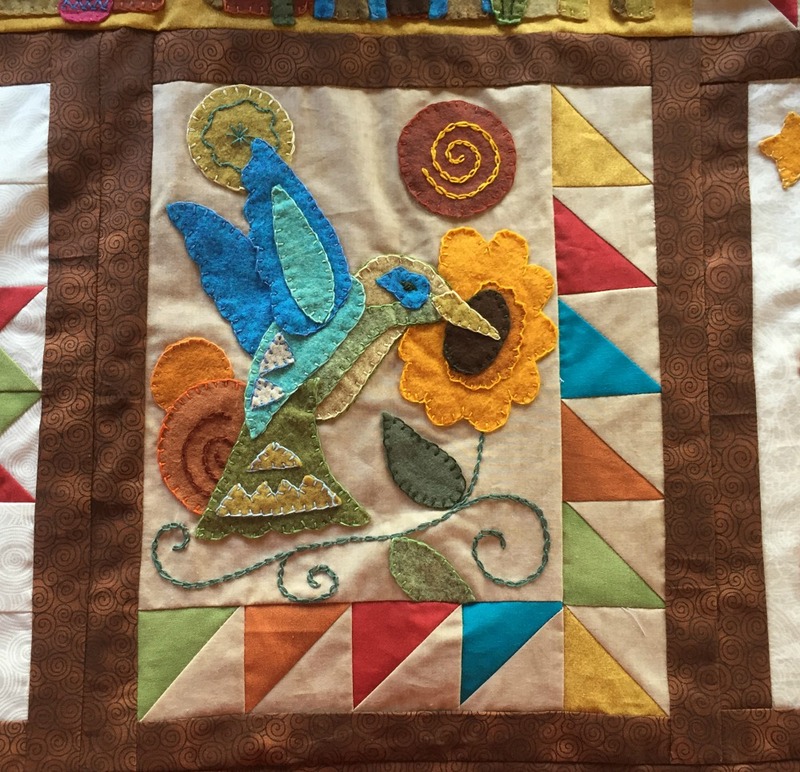 This month, I am featuring the instructions to create the Hummingbird and Coyote blocks. Two blocks that feature both fun applique and easy piecing. Sonoran Trail was created with southwestern influences, as I have spent the better part of the past few years exploring the beautiful vistas of Arizona. Sonoran Trail takes from all those experiences. This Sew Along will last until October 1, 2018. I will be walking you through this quilt top step-by-step with tips, and thorough instructions and free templates. We will create something beautiful together! Starting April 1, 2018, blocks will be offered on the first of the month. Two blocks (sometimes 3) each month, with the last being offered on October 1, 2018. Each set of blocks will be available free to all Sitcom Readers until the end of that month. If you are following along with this project, I recommend you mark your calendars and come in early to download the monthly installments. 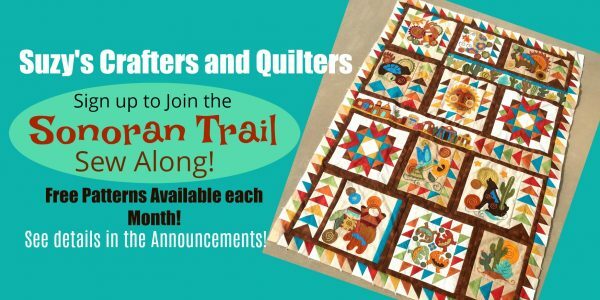 Or join us on the Suzy’s Quilters and Crafters Facebook group for monthly reminders. If you miss an installment, or come to the party late, past blocks will be available for a small charge. The full pattern is now available to purchase in my store. 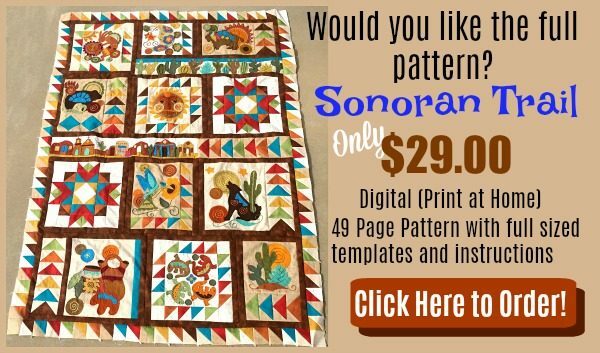 It is a 49 page digital pattern that can be downloaded immediately upon purchase. CLICK HERE to order! When you print out the templates, set your printer page set up to “Fit to Page”. 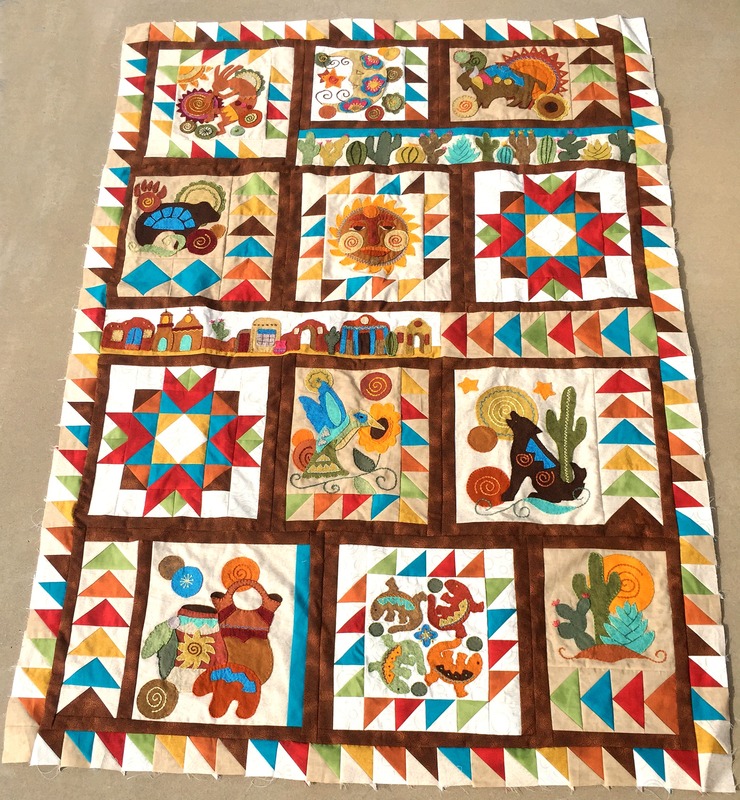 All blocks in this quilt were done using 8.5″ x 11″ paper. This particular quilt pattern is done in wool blend applique sewn onto 100% cotton fabric. My instructions are for that technique, but you can always change it out and create it with traditional applique! 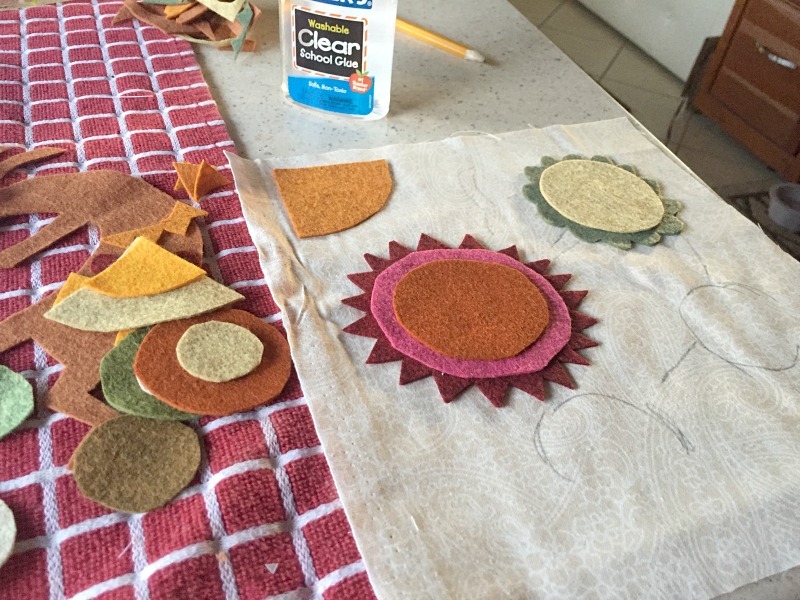 For a tips on how to place and applique wool blend felt, please see my post here. Available until September 1, 2018 – Hummingbird and Coyote. These block instructions and templates are only available for free until September 1, 2018. After that, they will be available for $4.99 each. So take advantage of a freebee and download them now! For over 200 crafty tutorials for all ages, visit my Tutorial Page! Next post: Make Beautiful Butterfly Window Clings! Previous post: 7 Fun Chicken Crafts!